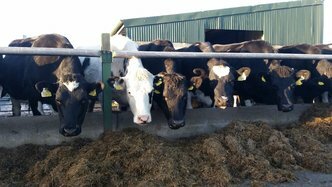 Now that the cattle are indoors and the cows are dried off, it’s a great opportunity for farmers to look after themselves. It’s a great time to start feeling better and getting fit in the process. Farmers exercise often gets neglected when times are hectic. Now is an ideal time to start exercising. After all.. it’s only 10 weeks to the first of February. It’s only 10 weeks until the first of February. This is when dairy farmers in particular get very very busy. As a dairy farmer’s wife (daughter and sister too! ), I know the Spring is very busy. This is usually when calving cows and rearing calves takes priority over exercise and even family! We see farmers every Spring in the clinic, towards the end of March and in April, with low back pain and shoulder pain. They are often exhausted from weeks of very long days and interrupted sleep. Exercising now will get you ready for the hard work ahead and reduce your risk of injury. A farmer’s work is done in the daylight mostly. This time of year, there is a window of opportunity between 5pm and 7pm, for farmers to exercise. It’s as simple as going into your local town or village any evening and doing a brisk walk for 20 minutes non- stop. It’s only about a mile and a half to walk. The important word here is ‘brisk’. Walking through the fields, unless at a brisk pace and non-stop, does not benefit you in the same way (though better than the quad!). You need to be doing this 20 minutes non-stop brisk walk at least 5 times a week- that’s Monday, Wednesday, Friday and both Saturday and Sunday. Saturday and Sunday go with friends, or go in the morning, just for variety. Better still, take a different route in the daylight. Gradually, increase the time to 30 minutes over the next few weeks. How fast is brisk walking? Brisk walking means that you should be breathing faster than at rest and be getting warm from your exercise. You should be able to talk, but not as easily as if you were standing still. If you really dislike walking, or have an injury that means you can’t walk for exercise , you have a few other options. An exercise bike is a great option as you can do this at home or in your local gym. The swimming pool is a nice alternative if you can’t walk as you can get the exercise without the landing on the ground. We run Pilates classes here at the clinic. Most towns and villages have some exercise classes or a gym- get good advice on your gym exercises if it’s new to you. Finally, last but certainly not least, dance classes- set dancing and social dancing- are a brilliant, fun way to get and stay fit. If you haven’t exercised in a while, or especially if you get chest pain or arm pain occasionally, please see your GP before starting your exercise. It would be no harm if you haven’t seen your GP in over a year to have a check-up anyway. Movember is a great campaign to raise awareness of mens health. Early detection of most diseases leads to better outcomes.